Lymphedema is a chronic condition that occurs as a result of a localized lymphatic drainage problem. Such problems may arise in various parts of the body, due to damage from any number of possible causes. Surgery or radiation for cancer treatment is a frequent cause of this damage. A significant percentage of women who undergo surgery and/or radiation therapy for the treatment of breast cancer will experience lymphedema, for example. This typically occurs in affected arm(s) due to damage to or removal of lymph nodes or vessels in the armpit and/or upper arms. Swelling due to lymph fluid that leaks into soft tissues is potentially uncomfortable and unsightly. It may also increase the chance of skin problems, such as increased susceptibility to infection. Doctors typically address lymphedema by recommending medical-grade compression wear. 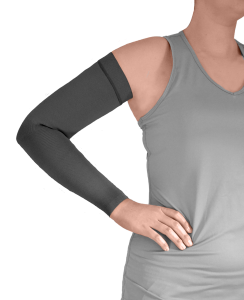 In the case of breast cancer-related arm swelling, a compression sleeve would be appropriate. People suffering from lymphedema in the legs, ankles or feet will be advised to wear compression stockings. The lymph system is a sort of secondary circulatory system; a network of vessels, fluid and nodes, along with a few immune system organs, such as the thymus and spleen. It serves to help the body eliminate toxins, waste, and other undesirable materials, while also combatting infection. Key lymph system cells are generated in the bone marrow. The lymphatic system operates in parallel to the more familiar blood circulatory system. The heart pumps blood under high pressure through its extensive network of arteries, veins and capillaries, and exchanges gases in the lungs. The lymphatic system operates more or less in parallel to this network, but relies more on passive influences, such as local muscle contractions, to assist in promoting lymph fluid flow. After traveling from distant places in the body, lymph drains through lymphatic ducts in the chest into veins in the upper chest, which eventually drain into the heart. Lymph fluid is essentially a clear liquid quite similar to blood plasma. It plays an important role in defending the body against infection and disease. It is a key component of the immune system, and contains disease-fighting white blood cells called lymphocytes. The lymph nodes, located at various places throughout the body, such as in the armpits, neck, upper chest, and groin, serve as filters that may help trap foreign cells and debris. Unlike the blood circulatory system, the lymphatic system is not closed. Lymph fluid (lymph) is free to move in and out of lymph vessels and into and out of the spaces between the body’s cells. These areas are called interstitial spaces. Graduated compression-wear garments are engineered to assist the body in its work by encouraging lymph fluid to move out of the interstitial spaces of affected tissues and return to the lymph vessels, for recirculation back toward the heart. Compression garments accomplish this by squeezing the affected tissues, putting pressure on lymph fluid and facilitating its return to the vessels for removal. Graduated compression—in which a garment squeezes your tissues more tightly the farther from the heart, and somewhat less tightly closer to the heart—works to facilitate lymph drainage. The external pressure exerted by your compression garment is a key component of your doctor’s plan for helping you control the swelling, pain and discomfort that may accompany lymphedema. Accordingly, it is important for patients to follow instructions regarding when, where and how often to wear their items. Proper skin care is also especially important. Skin in affected areas, such as the legs and ankles, may become thin, fragile and susceptible to drying, flaking or cracking. Most doctors will recommend that you keep the area clean, dry, and well moisturized with specially formulated skincare products. Skin may also be more susceptible to infection, so caring for the skin in affected areas is or paramount importance. Proper care of your compression wear is also important. Be sure to keep your item(s) clean and dry, following manufacturers’ directions for proper care. This will prolong the life of your item(s) and keep them in top shape. The final point to remember is this: While it may be inconvenient, or even uncomfortable at times, it is crucial that you wear your item(s) for as long as instructed, each day. Remove your item(s) at night, and don them again first thing upon rising, for best results. I am curious as to what happens when one flys that has no symptoms as of yet. And when wearing the sleeve on and off the plane. At what altitude does you need the compression garment?5000 feet 10.000 feet? I cannot seem to find any of these answers. Ps I am a very active person having had 14 lymph nodes removed 6 months ago. I am constantly looking at my arm after I workout. I am not ready to give up my Triathlon hobby just yet! also plan on traveling which will require flying.